Baba Is You is full of tricky levels to complete, few as tough as the twelfth in the Space section, which is called Guardians. Here’s everything you need to know about how to complete the Guardians Level in Baba Is You. First of all, push ICE up to spell ICE IS PULL below TEXT, which will allow you to move the ice nearer the bottom of the screen. Rearrange the ice so that it is in two rows that are seven blocks long. You can have the rest of it connected above, but ensure that those two rows are below the area where the UFOs are, with the right most ice tile being underneath the gap that they’re moving in. 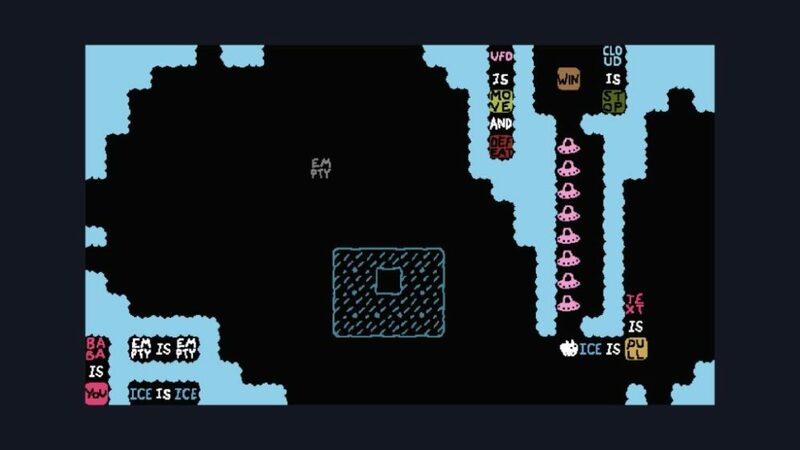 Then, to continue the Guardians Level in Baba Is You, move PULL so that it is second in from the right on the top row of ice, followed by a IS to the left of it. Next, grab the the other IS and place it above the first one. Then, put EMPTY above the second IS and TEXT to the LEFT of the first one. Then, push PULL left one space so that you spell EMPTY IS PULL and TEXT IS PULL in a backwards L shape. That will then see the UFOs stop moving in the gap and WIN will begin to fall towards you. Once it is in line with PULL, push PULL along so that EMPTY IS WIN is made, which will see you complete the Guardians Level of Baba Is You. For a visual representation, you can also check out Alayric‘s excellent video guide on the solution. That’s everything you need to know about how to complete the Guardians Level in Baba Is You. For more tips and tricks on the game, be sure to search for Twinfinite.